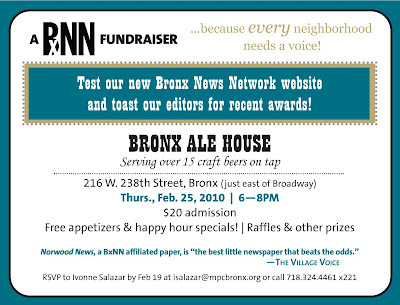 If you haven't yet RSVP'd for BxNN fundraiser at the Bronx Ale House on Feb. 25 and are planning on coming, please do it now. Don't miss out! We can only accommodate 80 people, so the sooner you let us know the sooner we can guarantee you a spot! (If you've run into one of us personally and told us you're going to come, you still need to formally RSVP.) It's going to be a great crowd of Bronx advocates, activists, community leaders and all-around Boogie-Down boosters. 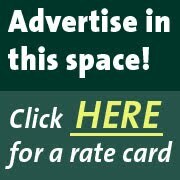 We also need your input on our new Web site which will be on display for attendees only! Admission is only $20. Appetizers will be served and there will be happy hour special on the Ale House's amazing craft beer selection! So e-mail Ivonne Salazar today at isalazar-at-mpcbronx-dot-org or call her at 718-324-4461, ext. 221.